“Orione” model display case with ventilated refrigeration is in low temperature (-14/-16°c). It’s studied for the coupling or the lining up to pastry display cases (as Sirio and Nancy models) in order to achieve furnishing line more versatile, homogeneous and personalized. The inside and outside tank in aisi 304 stainless steel is insulated by 60/80 mm-thick low-density ecological polyurethane. With R452A-valve evaporator, automatic defrosting with electrical resistances and hot gas. Temperature controller by electronic control unit. The speed of air exit is controlled by a potency regulator. The glass frame structure in siler anodised aluminium, as standard (gold on demand) with led light on the top and tank lined up end sides in glass. 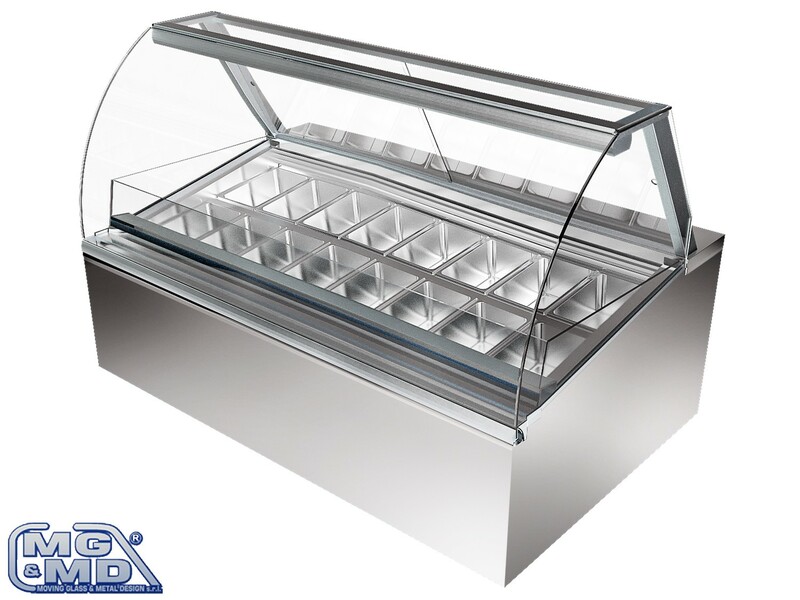 Technical and functional characteristics of this counter allow to the ice-cream display in containers of 3 or 5 litres (with the possibility to adjust inner compartments) or ice cream cakes and frozen desserts. Faired small tank for ice-cream proportioner.